Keenpac are pleased to announce the launch of a custom packaging box to the Keenpac stable, the tamper-evident mailing box. This brand new packaging innovation, which on the face of it is a simple corrugated mailing box, includes a unique security function, that makes it impossible to access without alerting the recipient. 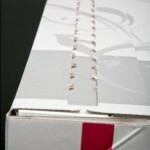 Using a similar mechanism to the closure seen on a regular mailing sack, the Safepac box includes a perforated strip that enables the customer to both open the box and close it securely should they wish to return the goods. They’re compelling benefits many retailers have been quick to grasp, and the box, which is already being sampled with a number of Keenpac clients, is due to launch in Jacques Vert in December – just in time for Christmas.